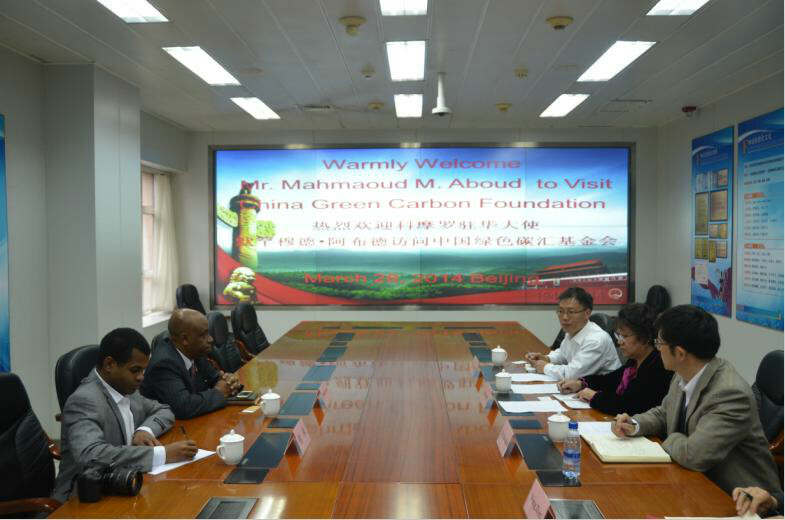 On March 28, Mr. Mahmoud M. Aboud, the Ambassador of Comoros to the People's Republic of China, visited China Green Carbon Foundation (CGCF for short). Ms. Li Nuyun, the Secretary-general of CGCF and Executive Deputy Director of Climate Office, State Forestry Administration, P.R. China, met the visiting guests. Mr. Mahmoud M. Aboud revealed that as deeply attracted by the activities and projects conducted by CGCF, which were introduced in its official website, he decided to pay a visit in person to the foundation. Comoros, the so-called kingdom of perfume, overshadows other countries in the world with its long-term unparalleled output in Ylang-ylang essence. Also, the country, added Mr. Mahmoud M. Aboud, is the famous hometown for lilac, Vanilla, and mint in the world. Yet, this country, which was heavily dependent on wood as energy, suffered severe deforestation as a result. Besides, this island country is also extremely vulnerable to climate change. Thus, Mr. Mahmoud M. Aboud believed that it was imperative for Comoros to change its prevailing mode of energy consumption, as one way to enhance its adaptability to climate change. To his delight, he found the foundation is equipped with excellent expert team, superior carbon sink forestation technologies, advanced carbon sink measurement and supervision standards, which are good for its country to learn from to address deforestation problems. 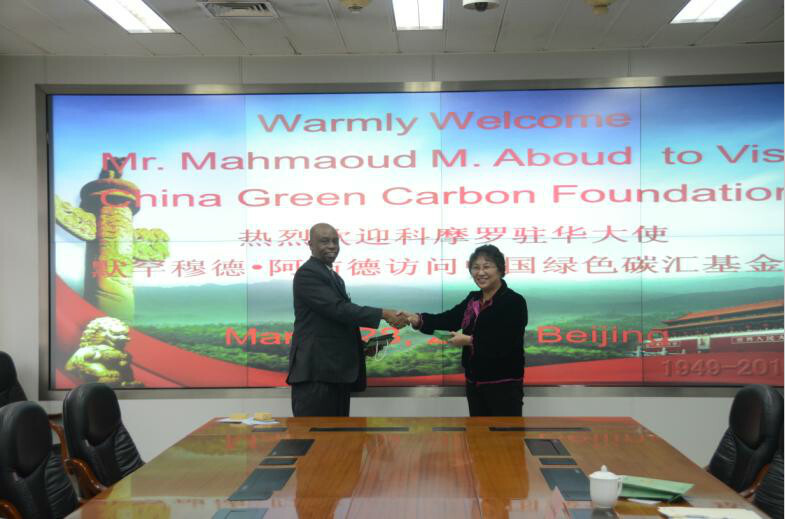 Mr. Mahmoud M. Aboud desired to, by referring to the practice and philosophy of CGCF, launch some carbon sink forestation projects in communities of his homeland, where local citizens could participate to help strike a balance between economic development and environmental projection, and to, among multiple goals, improve living conditions of local people. Ms. Li introduced to the visiting delegation of CGCF’s the establishment background; conducted missions, research progress as well as domestic and overseas practices in carbon sink forestation. As shared by Ms. Li, Comoros could fulfill some of its goals through such channels: firstly, applying for financial and technical support to Forest Carbon Partnership Facility as set by the World Bank; secondly, applying to Chinese government for forestry-related assistance projects under Forum on China-Africa Cooperation mechanism; thirdly, seeking assistance from Comoros-based Chinese enterprises based on sound communications; fourthly, as for forestation projects planned to be implemented, Comoros could make them into forest carbon sink projects tradable in global carbon sink market by reliance on the help from the expert team of CGCF, and reference to the globally recognized forest carbon sink manufacture and certification standards.